For high-productivity firms, export shocks that provide access to an expanded market lead to greater innovation, even though such shocks may also bring new competitors. Economic theory identifies two effects of a positive export shock that increases access to new international markets. On the one hand, access to a larger market could increase a firm's incentive to innovate because larger markets promise larger innovation rents. On the other hand, the larger market could attract new entrants, increasing competition, reducing both profits and innovation rents, and thus discouraging innovation. The relative magnitudes of these effects in any given market setting is an empirical question. In The Impact of Exports on Innovation: Theory and Evidence (NBER Working Paper No. 24600), Philippe Aghion, Antonin Bergeaud, Matthieu Lequien, and Marc J. Melitz explore this issue. 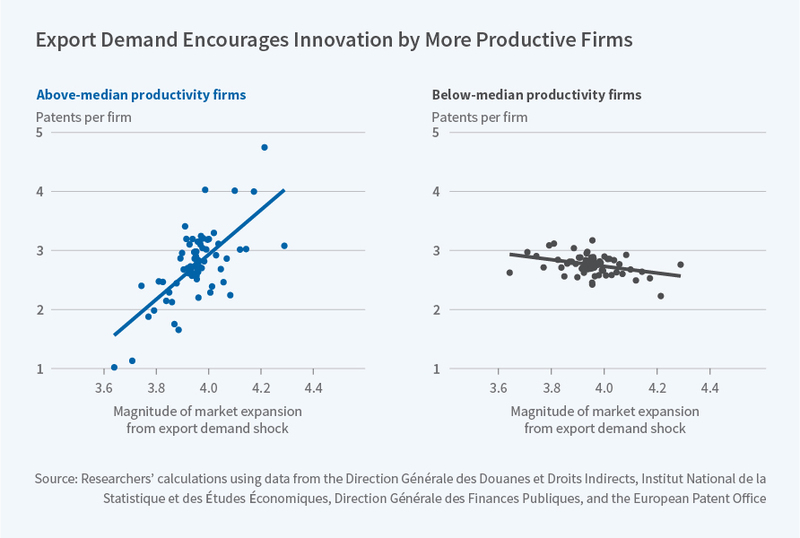 They find that for high-productivity firms, those close to the productivity frontier, the positive effect of greater market size on innovation is larger than the negative competition effect. For those firms, positive export shocks are associated with an increase in the number of patent applications filed. Among less productive firms, the competition effect, which discourages innovation, appears to dominate. For these firms, positive export shocks are associated with a decline in innovation. The researchers develop these findings by analyzing linked data on patents, customs, and production among French manufacturing firms over the period 1994-2012, a period during which trade liberalization resulted in significant export shocks. They find that "exporters are substantially more likely to innovate, and innovators are more likely to export." Only 5 percent of innovative firms report no exporting, while most are large exporters. Innovative exporters employ 4.5 times more workers, produce about eight times more output, and export to three times as many destinations as non-innovative exporters. These differences are not accounted for by differences in the sectors in which high- and low-innovation firms operate. The relationship between export share and innovation is particularly dramatic at the high end of the export distribution. "Above the 95th percentile of the export distribution, a majority of firms are innovators; in the top percentile, 68 percent of the firms are innovators," the researchers write. "Those firms in the top export percentile account for 41 percent of the aggregate share of French patents."